Notice how shiny her coat is! Can't wait to share stories about the meals I put together using this superior and wholesome beef product! 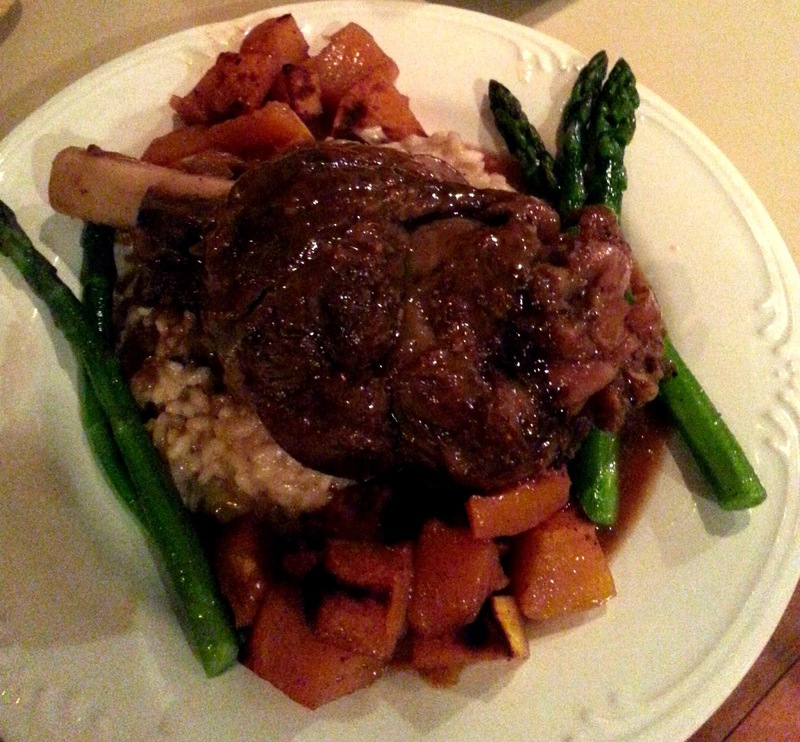 I love braised meat and one of my favorites is Osso Buco. Originally considered a peasant dish, Osso Buco has risen in reputation and is now highly regarded as elegant fare fancy enough for a dinner party. Osso Buco is Italian for Bone with a Hole. The reason for slow cooking meat is to allow the bone marrow and juices to richly flavor your broth and the slow cooking to break down the toughness of the cut. This is what makes Osso Buco and other braised meats so delicious. I like to cook this dish the day before serving as it gets even better by sitting overnight. It then also falls into my 'do-ahead' category perfect for a party. in a little cheesecloth and tied it before adding to the stock. This northern Italian dish, Milan to be precise, is traditionally made with veal shanks which are cut crosswise on the bone making the marrow readily available to scoop out with a little spoon. I like veal, but can't bring myself to eat it because of how inhumanly the cows are treated. It's just not right. (If you are using veal you will want to tie them in kitchen string so the meat stays intact around the bone.) 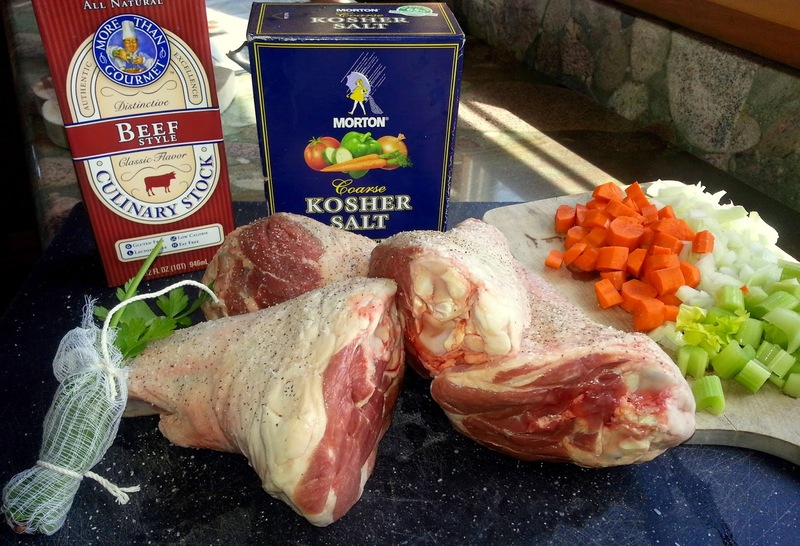 Instead I use lamb shanks or pork. These shanks, which are cut from the animals' shin, are not cut crosswise on the bone so you lose the benefit of eating the marrow, but it still seeps into the broth giving it a heavenly flavor. Shanks are a tough cut, but once cooked slowly in broth over very low heat become tender as butter. Here's my recipe which varies slightly every time I make it, but incudes these basic ingredients. 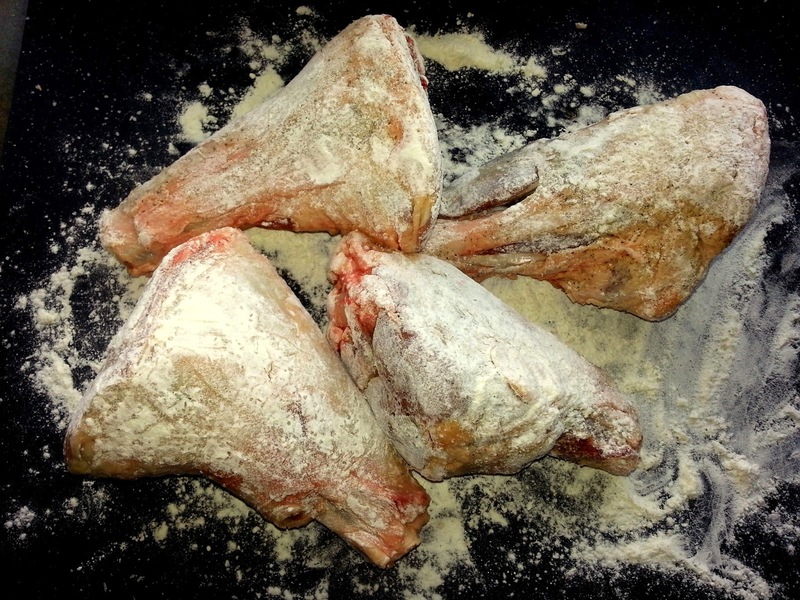 Lamb shanks dredged in flour. Pat the shanks dry with a paper towel (All meats brown better if they are dry to start.) Liberally salt and pepper the shanks. Dredge in flour. Shake off excess. 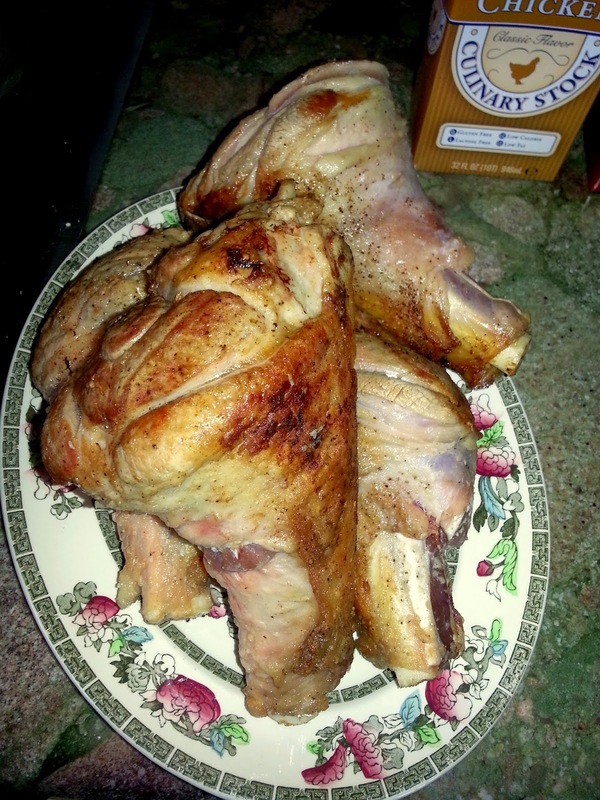 In a large Dutch oven or roasting pan, heat vegetable oil and 1 Tbsp. butter until bubbling hot. Brown all sides of the shanks, about 3 minutes per side. Brown 2 shanks at a time so the oil temperature stays nice and hot. Remove browned shanks and reserve. In the same pan, add the onion, carrot, and celery. Season with a little more salt to draw out moisture from the veg. Saute until soft and translucent, about 10 minutes. Add the tomato paste (or can of tomatoes) and mix well. Return the browned shanks to the pan and add wine and reduce by half simmering about 5 minutes. Add the herbs (either loose or tied bouquet garni), and 2 cups of the chicken (or beef) stock. Bring to a boil. Reduce heat, cover pan and simmer for about 2 hours or until the meat is falling off the bone. Depending on the size and cut of your shank this may take longer. The important thing is that the meat be VERY tender. Check every 20 minutes or so to make sure the liquid has not reduced too much. Add more stock if necessary to keep shanks about 3/4 deep in sauce. When the shanks are done, carefully remove from the pan and place on a decorative platter. Pour all the juices and sauce from the pan over the shanks. Garnish with chopped parsley and a little lemon zest. Or in Milan they would garnish with a classic gremolata (chopped parsley, lemon zest and finely diced garlic) and serve over risotto-Ossobuco ala Milanese. Osso Buco has this affect on people. 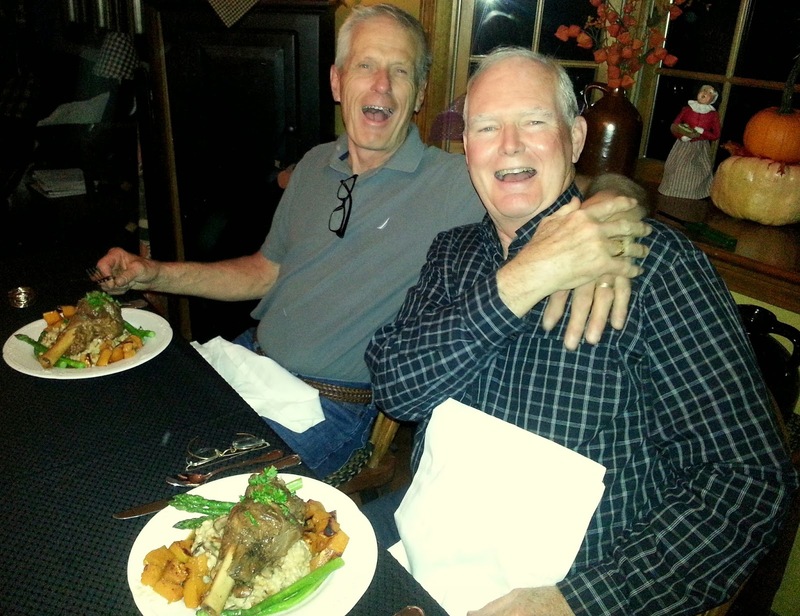 Here is my husband Jerry (in foreground) with his dear friend Lee about to dig in! I usually serve with a mushroom risotto and lightly steamed asparagus. Above I also included roasted butternut squash which made the meal even heartier! It's equally great served over spaghetti, polenta or even creamy mashed potato! Experiment! Enjoy! Remember, this is an old-world, old-fashioned stew...you can't make a mistake! 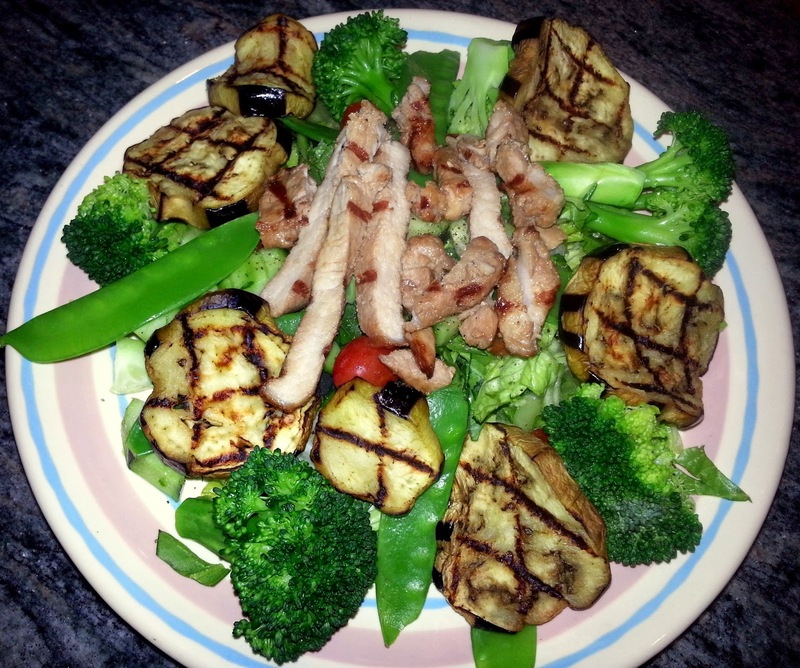 GRILLED PORK MAKES A SALAD SPECIAL! This salad is served with barely blanched broccoli, crispy snow peas and grilled eggplant over a bed of finely chopped romaine, diced cucumber, cherry tomatoes; topped with a sliced pork chop which I took off the bone and marinated most of the afternoon in soy sauce, a few drops sesame oil, 5 cloves of roasted garlic, and fresh chopped ginger-root. The chop cooks very quickly on a hot gas grill. Slice and serve with your favorite dressing. I used rosemary/garlic vinaigrette. I LOVE THE BITE OF ARUGALA! 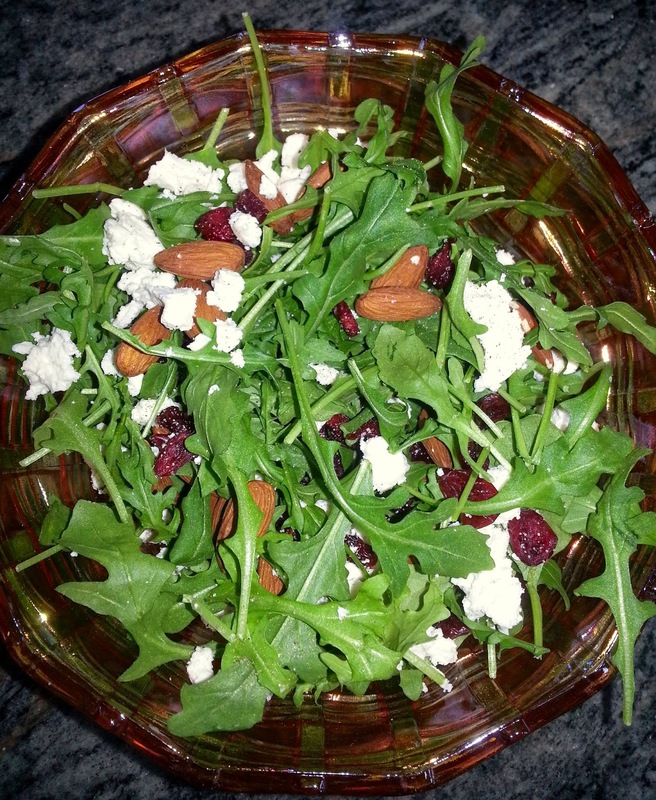 Baby arugala with goat cheese, dried sweetened cranberry and whole raw almonds. A little salt, pepper and dressed lightly with a citrus vinaigrette (see previous blog posting for vinaigrette recipe. 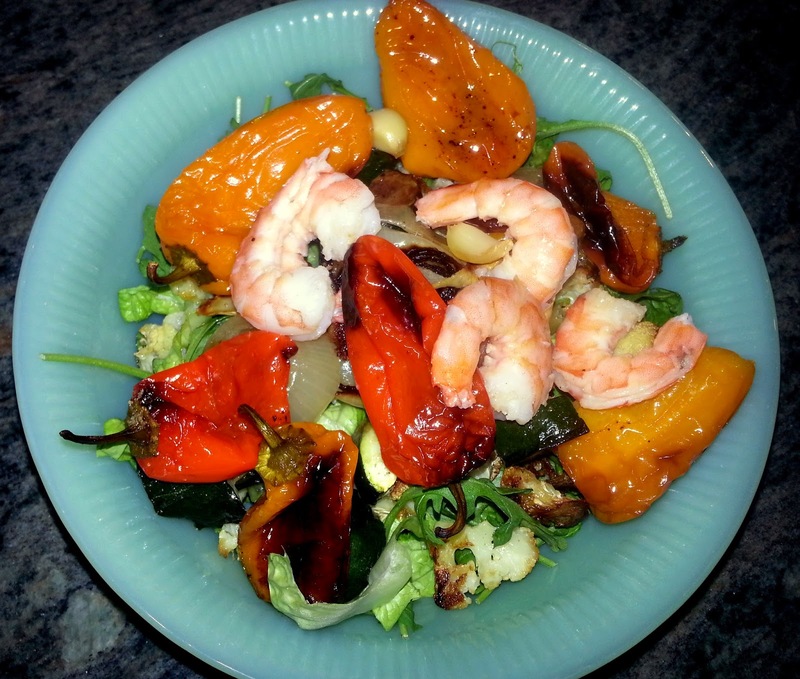 Go to search box at top left of homepage and search for citrus vinaigrette) and you have a light a delicious dinner! I roasted a whole tray of cauliflower, zucchini, onion, garlic, and baby bell peppers at 400 degrees for about 45 minutes. Lightly sprinkle with olive oil, salt and pepper before roasting. It's good to make extra so you can put in your omelet in the morning and add to another salad for lunch next day. I tossed the shrimp, still frozen, onto the roasting tray still in their shells for the last 15 minutes of roasting. When they are cool enough to touch, peel them, top your salad, and enjoy your healthy dinner! 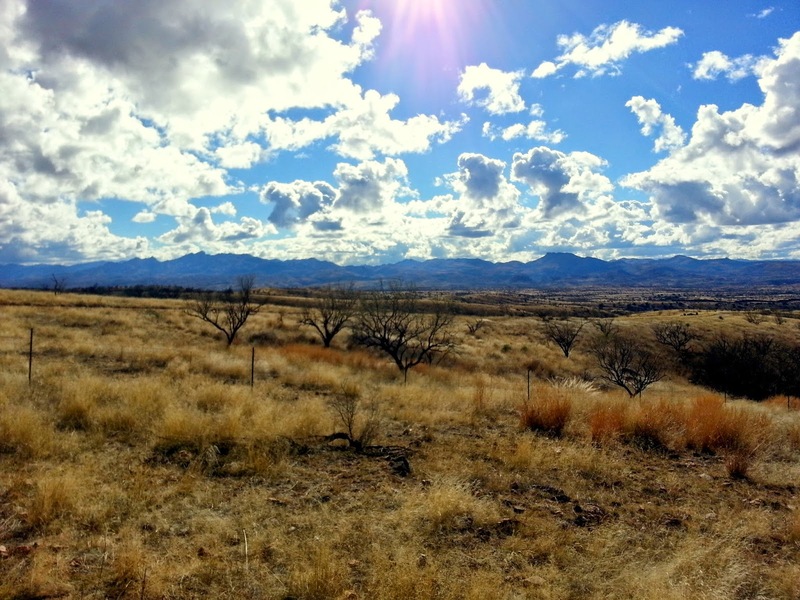 That's it for today, but before I go I want to tell you about a local rancher I recently met who raises beautiful cows in the Argentine tradition, right here in southern Arizona. No pesticides, additives, hormones...all natural out on the range. 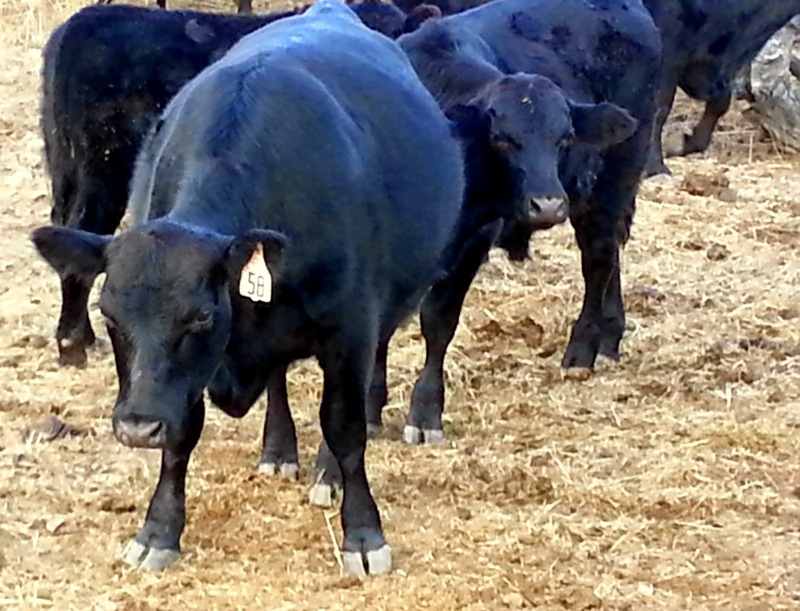 Duncan and his wife Susan Blair of Rico Santa Cruz Ranch finish their beef with what he refers to as a salad of grasses-both annual and perennial. I sampled a leaf of alfalfa from the rich gorgeous soil and it was delicious so I know these cows are enjoying it, too. I just bought a 40 lb. family-pack of his beef which includes lots of different cuts so get ready for some new and exciting recipes! The first roast I am going to make is an Arm Roast which I will braise in wild mushroom and red wine gravy. Can't wait to try it and share with you! UNTIL NEXT TIME...REMEMBER THAT LOTS OF COOKING HELPS KEEP YOUR FUEL BILLS DOWN IN WINTER MONTHS SO KEEP THAT OVEN BURNING! 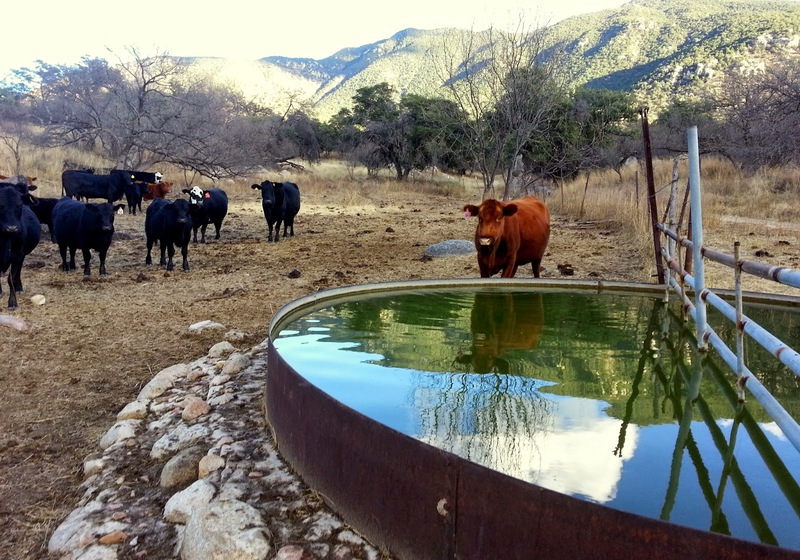 healthy, and happy critters on the Rio Santa Cruz Ranch.